Arriving at Saligo Bay on the west coast of Islay is a nice experience, with the view slowly opening up as you walk down the path through the dunes on to the beach. This view is about half way down the dunes, looking on to the beach and the cliffs in the south west. This was taken on a slightly cloudy but colourful October evening with sunset approaching soon. 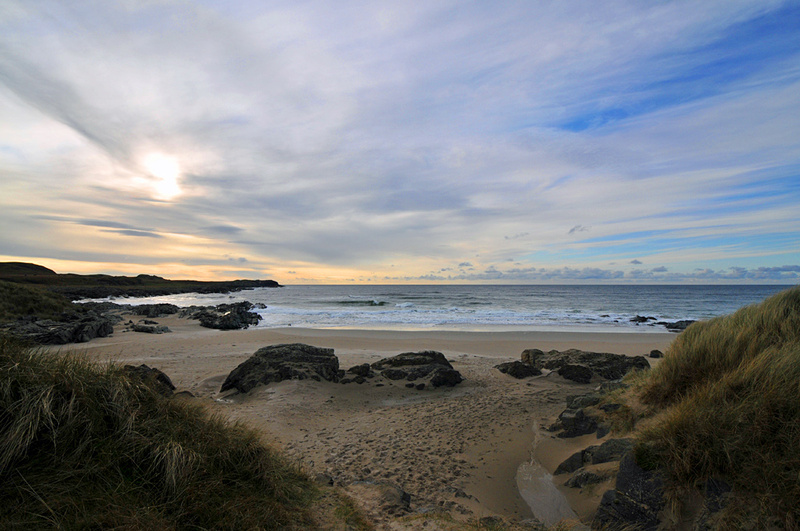 This entry was posted in Beaches, Cloudy Weather, Landscape, Repost, Sunny Weather, Sunset and tagged Islay, Rhinns of Islay, Saligo, Saligo Bay by Armin Grewe. Bookmark the permalink.